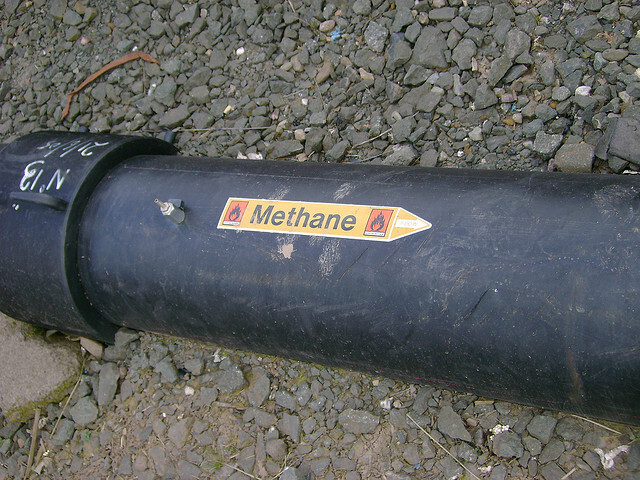 A pipe carries methane in the United Kingdom. In the debate surrounding the United States&apos; natural gas resources, it is often noted that methane, the primary component of natural gas, is 21 times more potent a greenhouse gas than carbon dioxide. There are two main issues with that statement, although that is the figure used by the Environmental Protection Agency. Carbon dioxide, whose concentration recently reached a long-feared milestone, remains the most important greenhouse gas trapping heat in the atmosphere. But as we open more oil and gas wells, even small amounts of methane leakage could tilt the balance of greenhouse gas emissions from new fossil fuel resources. The ratio of a molecule’s ability to trap heat, and thus cause global warming, relative to one molecule of carbon dioxide is called its global warming potential. The EPA recently proposed raising raising methane&apos;s global warming potential to 25. Amending the number to 25 would be a 19 percent increase — significant, but only keeping pace with revisions codified more than six year ago in the fourth Intergovernmental Panel on Climate Change (IPCC) report. The 21 figure used by EPA was first put forth in the 1990s. IPCC upped it to 23 in 2001. Its fifth report is expected later this year. The other issue is that methane is especially short-lived. Unlike carbon dioxide, which persists in the atmosphere for 500 years, methane only lasts about 12 years in the atmosphere before chemical reactions break it down. EPA typically estimates global warming potentials based on 100-year timescales, but estimated over a 20-year time scale methane could be more than 50 times more potent than carbon dioxide. Why does that matter? In the short-term, methane and other short-lived gases could exacerbate near-term climate impacts, just as the world struggles to get the real driver (CO2) under control. One California congressman recently proposed a bill targeting those short-lived pollutants to mitigate near-term climate change. Researchers at NOAA and the University of Texas at Austin are working on a review of greenhouse gas emissions from natural gas. An EPA revision recently rolled back its estimate of emissions from one part of the fracking process but simultaneously upped its most recent figure for emissions from fracking itself. EPA will accept comments on the proposed rule until May 17. Comments should reference docket No. EPA-HQ-OAR-2012-0934.